Josselin castle is a notable chateau in France. Josselin stands beautifully in the eponymous municipality in the department Morbian (Morbihan department), on the southwestern French region of Brittany. The palace is among the most important and most beautiful castles of the country, has the status of historical monument. The actual town Josselin is extremely pleasant and interesting with its small medieval streets, woven semi-wood ancient houses with attractive roofs. Additionally, it gives a sense of harmony and runs through the town river Oust. The first medieval castle, the high spot overlooking the river valley appears around 1008. At 1080 Josselin appears in the local registry under the name castrum Goscelini, but around 1108 he was already famous by the name Castellum Goscelini. The original castle here was demolished by King Henry II in 1168, when the British tried to seize Brittany as their territory. Construction of the present fort began around 1173. Around 1370 the Josselin castle with significantly enhanced structure, added several watchtowers. 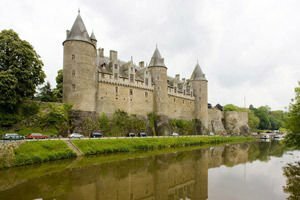 In parallel, the living quarters were expanded, and the renovation of Josselin continued until the early 15th century. After this time the castle becomes the vision of a beautiful Renaissance palace with well-fortified tower with excellent views of the river, with a nice facade and generous interior decoration. Interestingly, the Josselin castle already has 500 years of family ownership by the Rohan family. They obtain a large family participation in the religious battles that time, which led Cardinal Richelieu to attack and destroy most of the castle. The year was 1629, and Josselin awoke with five out of nine towers destroyed. Over the next 206 years Josselin was buried in oblivion and decay, which takes the brilliance of its construction. When Napoleon used it for jail and storage. New life awakens the palace in 1835 when the Duke of Rohan takes care of its restoration. The furnishing of the end of 19 century and today can be seen in the publicly accessible rooms of Josselin . Among the most remarkable rooms of the palace is that of the large dining room and lounge. Many rooms in Josselin are not open to the public because they are private family residence of Rohan. However park Josselin is open for visits. Built with a beautiful French garden, English garden (less accessible to outsiders) and a nice rose garden. In the former stables of Josselin, a Museum is situated of over 400 dolls with original clothes from 17-19 century.